Stirrup Bender WG12D-4(stirrup rebar) has the particular patented straightening system, constituted by sets of horizontal and vertical rollers that can be automatically adjusted, is integrated with 4 pulling rollers that eliminate the torsion, which is driven by servomotor, thus ensuring a perfect straightening accuracy. For this Stirrup Bender WG12D-4(stirrup rebar), many electric and pneumatic parts are imported from Japan and German, such as PLC, servomotor and reducer. A Stirrup Bender WG12D-4(stirrup rebar) available to the most 30 bends; 500 different stirrups parameter can be stored in the computer memory. The Stirrup Bender WG12D-4(stirrup rebar) needs no pause and stop while processing stirrups of any shapes and adjusting bending angle. With self-diagnosis, there are two standards exit, through which the electric encoder can be joined. Wheels for straightening are large diameter ensures large pressing power and pressing area, all lower wheels are driven wheels, ensures fast and good quality straightening. The machine can be connected with the software management system to achieve automatic data transmission and scan input. Stirrup Bender WG12D-5X has the particular patented straightening system, constituted by sets of horizontal and vertical rollers that can be automatically adjusted, is integrated with 4 pulling rollers that eliminate the torsion, which is driven by servomotor, thus ensuring a perfect straightening accuracy. The bending and cutting unit of Stirrup Bender WG12D-5X, driven by servomotor, is equipped with turning and retractile bending pins. After receiving a signal from the computer, the cutting unit starts and cut in the twinkling guaranteed the tolerance of the stirrup. For this cnc wire bending machine, many electric and pneumatic parts are imported from Japan and Germany, such as PLC, servomotor and reducer. A CNC wire bending machine available to the most 30 bends; 500 different stirrups parameter can be stored in the computer memory. The Stirrup Bender WG12D-5X needs no pause and stop while processing stirrups of any shapes and adjusting bending angle. Fixed cutter can be used on both sides to improve the service life; cutting knife is designed with four available sides, service life increased by 4 times, greatly reducing costs. Stirrup Bender WG12B-2(stirrups rebar) has the particular patented straightening system, constituted by sets of horizontal and vertical rollers that can be automatically adjusted, is integrated with 4 pulling rollers that eliminate the torsion, which is driven by servomotor, thus ensuring a perfect straightening accuracy. 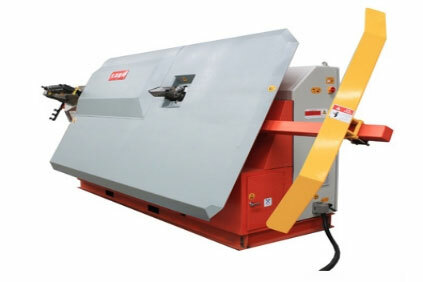 The bending and cutting unit of Stirrup Bender WG12B-2(stirrups rebar), driven by servomotor, is equipped with turning and retractile bending pins. After receiving a signal from the computer, the cutting unit starts and cut in the twinkling guaranteed the tolerance of the stirrup. For this Stirrup Bender WG12B-2(stirrups rebar), many electric and pneumatic parts are imported from Japan and German, such as PLC, servomotor and reducer. A Stirrup Bender WG12B-2(stirrups rebar) available to the most 30 bends; 500 different stirrups parameter can be stored in the computer memory. The Stirrup Bender WG12B-2(stirrups rebar) needs no pause and stop while processing stirrups of any shapes and adjusting bending angle. Stirrup Bender WG12E has the particular patented straightening system, constituted by sets of horizontal and vertical rollers that can be automatically adjusted, is integrated with 4 pulling rollers that eliminate the torsion, which is driven by servomotor, thus ensuring a perfect straightening accuracy. The automated wire bending and cutting unit of Stirrup Bender WG12E, driven by servomotor, is equipped with turning and retractile bending pins. After receiving a signal from the computer, the cutting unit starts and cut in the twinkling guaranteed the tolerance of the stirrup. For this Stirrup Bender WG12E, many electric and pneumatic parts are imported from Japan and German, such as PLC, servomotor and reducer. A Stirrup Bender WG12B-2 available to the most 30 bends; 500 different stirrups parameter can be stored in the computer memory. The Stirrup Bender WG12E needs no pause and stop while processing stirrups of any shapes and adjusting bending angle. Stirrup Bender WG12F has the particular patented straightening system, constituted by sets of horizontal and vertical rollers that can be automatically adjusted, is integrated with 4 pulling rollers that eliminate the torsion. Stirrup Bender WG12F has the particular patented straightening system, constituted by sets of horizontal and vertical rollers that can be automatically adjusted, is integrated with 4 pulling rollers that eliminate the torsion, which is driven by servomotor, thus ensuring a perfect straightening accuracy. The bending and cutting unit of Stirrup Bender WG12F, driven by servomotor, is equipped with turning and retractile bending pins. After receiving a signal from the computer, the cutting unit starts and cut in the twinkling guaranteed the tolerance of the stirrup. For this wire stirrups bender WG12F, many electric and pneumatic parts are imported from Japan and German, such as PLC, servomotor and reducer. A stirrup bender WG12F available to the most 30 bends; 500 different stirrups parameter can be stored in the computer memory. The stirrup bender WG12F needs no pause and stop while processing stirrups of any shapes and adjusting bending angle. Automatic multifunctional machine to work hot-rolled, cold-rolled or cold-drawn wire rod in coils, to produce a continuous automatically collected stirrup or single stirrup. It is activated through digital servo-motors. In horizontal position downward it produces continuous stirrup, in the position tilted produces stirrups. Stirrup Bender WG12G has the particular patented straightening system, constituted by sets of horizontal and vertical rollers that can be automatically adjusted, is integrated with 4 pulling rollers that eliminate the torsion, which is driven by servomotor, thus ensuring a perfect straightening accuracy. The bending and cutting unit of Stirrup Bender WG12G, driven by servomotor, is equipped with turning and retractile bending pins. After receiving a signal from the computer, the cutting unit starts and cut in the twinkling guaranteed the tolerance of the stirrup. For this Stirrup Bender WG12G, many electric and pneumatic parts are imported from Japan and German, such as PLC, servomotor and reducer. A Stirrup Bender WG12G available to the most 30 bends; 500 different stirrups parameter can be stored in the computer memory. The Stirrup Bender WG12G needs no pause and stop while processing stirrups of any shapes and adjusting bending angle. Stirrup Bender WG16B (steel wire bending machine) has the particular patented straightening system, constituted by sets of horizontal and vertical rollers that can be automatically adjusted, is integrated with 4 pulling rollers that eliminate the torsion, which is driven by servomotor, thus ensuring a perfect straightening accuracy. The bending and cutting unit of Stirrup Bender WG16B(steel wire bending machine), driven by servomotor, is equipped with turning and retractile bending pins. After receiving a signal from the computer, the cutting unit starts and cut in the twinkling guaranteed the tolerance of the stirrup. The Stirrup Bender WG16B(steel bar bending machine) needs no pause and stop while processing stirrups of any shapes and adjusting bending angle. Stirrup Bender WG16F has the particular patented straightening system, constituted by sets of horizontal and vertical rollers that can be automatically adjusted, is integrated with 4 pulling rollers that eliminate the torsion, which is driven by servomotor, thus ensuring a perfect straightening accuracy. The bending and cutting unit of Stirrup Bender WG16F, driven by servomotor, is equipped with turning and retractile bending pins. After receiving a signal from the computer, the cutting unit starts and cut in the twinkling guaranteed the tolerance of the stirrup. For this wire bender CNC machine, many electric and pneumatic parts are imported from Japan and Germany, such as PLC, servomotor and reducer. The Stirrup Bender WG16F needs no pause and stop while processing stirrups of any shapes and adjusting bending angle.